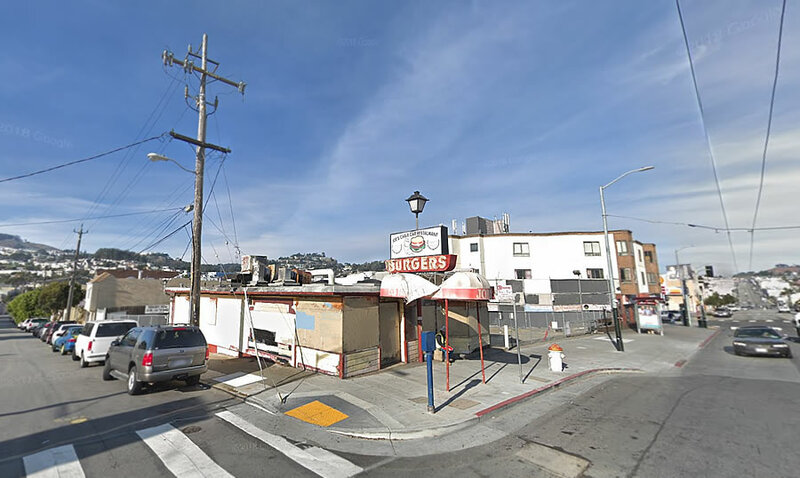 Having shuttered back in 2014, after nearly five decades of serving freshly ground burgers to a legion of adorning fans, a permit to raze the iconic Joe’s Cable Car shack, on the northwest corner of Mission and Tingley Streets, has been requested. 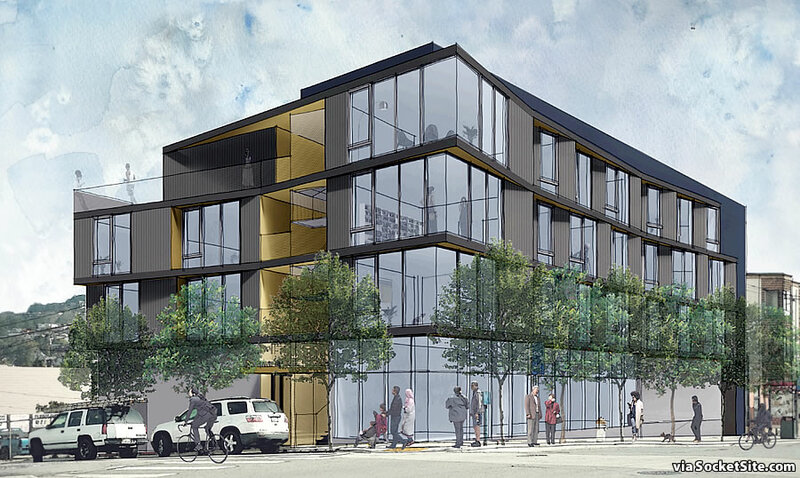 And as envisioned, a contemporary four-story building designed by Fougeron Architecture will rise up to 45 feet in height upon the Excelsior District site, which includes the adjacent parking lot fronting Mission. The proposed development would yield nine (9) residential units (a mix of one (1) one-bedroom, six (6) twos and two (2) threes) over 2,100 square feet of new ground floor retail space and an at-grade garage for three (3) cars, along with a new 2 Tingley Street address. And with a requested rear yard modification and variance for the design of the proposed bays along Mission likely to be approved by the City next week, we’ll keep you posted and plugged-in. May as well…..just don’t touch my Excelsior dive bars. I don’t get out much anymore with a family and all, but I was partial to The Office, The Doctor’s, and the Rink-a-Tink Club. Broken Record is good too, although it’s in Crocker-Amazon. The last time we ate at that place it was over $40 for a couple burgers and fries. Kind of like the gas station that charged double prices and so was empty and now is condos as well. The path to planning approval is circuitous for sure. Get ready for a DR from 282 Silver. 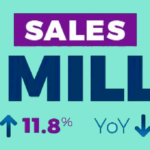 Check out the (huge!) pool and patio in their back yard. I would be shocked if they didn’t try to fight this. Do you think they will have any grounds on which to fight it? I have to think that having a pool & patio in a city environment doesn’t give you the right to stunt growth on an adjacent lot, but given this is SF anything is possible. I rarely find DRs to have any grounds, yet they always come up. If it’s not light, air or privacy, it will be Joe’s history that needs to be saved. That sounds like the primary motivation. I was thinking that having fewer units with more bedrooms was probably a good thing (flexibility for families or roommates), but was the BMR policy actually intended to create that incentive, or is it just an unintended consequence? The policy at 9 units was created to allow for more of small projects. It was a big push from the Residential Builders Assoc. to get it moved up from 5 a while back because that number was stifling small projects. This lot is bigger than the lots it was targeting at the rewrite through. So the BMR rules are related to why it has stayed in limbo for so long? Anything else, or just holding out? No. 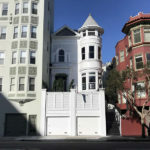 The bogeyman known as San Francisco’s inclusionary housing (BMR) law, which was relaxed in 2012, has nothing to do with why this parcel has yet to be developed. What’s wrong with KFC Taco Bell? There has to be something kept affordable. With all these new buildings will come much more expensive restaurants. That can be a good thing, however, out of reach for most working class struggling to pay the rent.